Walleye are one of the number one gamefish in the northern parts of North America. Wherever they are found they have a large following of anglers who are obsessed with fishing for them. These schooling predators can be taken on a variety of fishing methods. With a mouthful of rear-facing, hooked teeth, they are a menace to any baitfish in the lake. Known for having highly sensitive vision, they have the upper hand on their prey in low-light situations, especially dawn and dusk. While other fish’s eyes take time to adjust, walleye capitalize on this and become most active. Walleye have a unique and telltale body shape. With a spiny dorsal, protective gill plate, a mouthful of teeth, and armoured scales, walleye are built for not only deterring predators but they also are built for detecting prey, especially in low light situations. This skeleton is only available with FISHBUM Outfitters. 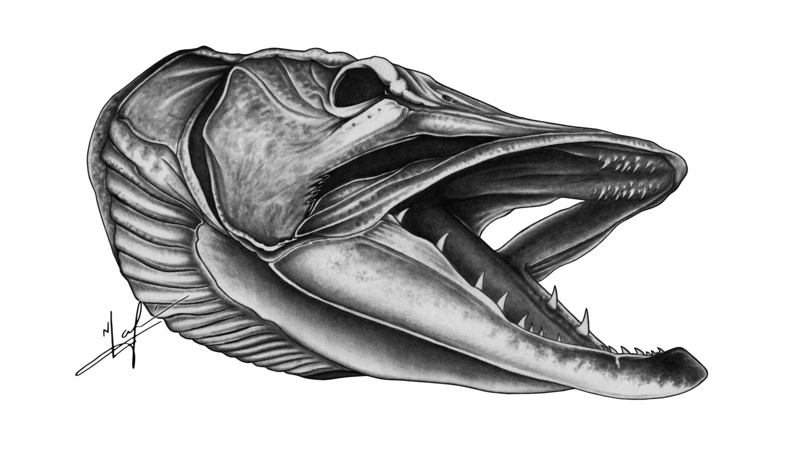 This entry was posted in Skull Art and tagged art, artwork, bones, drawing, fishbum, laferriere, nick, painting, pickerel, skeleton, skull, teeth, walleye on May 28, 2013 by nicklaferriere.